2018 marks the 80th anniversary of the building of Santa Sabina. We celebrated how the Center has served so many since its inception—first as a house of study and prayer for new members of the Dominican Sisters of San Rafael and now as a house that fosters contemplative ways of being for spiritual seekers across many spiritual traditions. Our efforts to maintain Santa Sabina as a place of beauty and silence for seekers near and far continue as we live into the fullness of our eightieth year. We deeply appreciate all gifts. No gift is too small. We welcome such expressions of gratitude from our guests. These contributions to general support enable us to enhance what we have available in the center and to respond to unanticipated emergency repairs. We offer assistance to as many as we can. 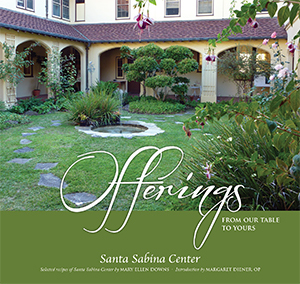 Please continue to consider this a valuable way to share the fruits of your own Santa Sabina blessings with others. We have been fortunate to continue major projects such as the updating of the kitchen and dining room, the replacement of the roof, and addition of ceiling fans in the 1959 wing of the building. Major gifts and bequests have enabled us to attend to these improvements. We maintain a list of such projects and welcome your contributions to these major projects. Guests delight in our gardens. Even now the drought is stressing our plants and taking a toll. Your gifts to the garden help us maintain the effort and care for the natural beauty that surrounds the center, creating the opportunity to replant, filling in the gaps where some shrubs and smaller plants have died. Give someone you know a blessing of peace and respite. Gift certificates are available for programs or for the bookstore. It is a wonderful way to thank someone you know and introduce them to a place you love.